The Peoples Democratic Party (PDP) have said that the arrest and detention of Precious Chikwendu, wife and son of former Spokesperson of the PDP Presidential Campaign Organisation (PDPPCO) is ‘tyranny taken too far by the Buhari government’. The party made this known in a statement signed by Prince Dayo Adeyeye National Publicity Secretary and made available to Vanguard. 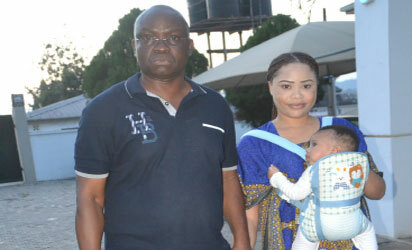 The statement read thus Governor Ayodele Fayose of Ekiti State and Mrs Fani-Kayode after her release. ”We condemn, in its entirety, the arrest and detention of Precious Chikwendu, wife of Chief Femi Fani-Kayode – former Spokesperson of the PDP Presidential Campaign Organisation (PDPPCO) – on ) October 17, 2016 by officials of the Economic & Financial Crimes Commission (EFCC) in Ado-Ekiti. She was arrested along with her 8 month old son, Aragorn, and would have been detained but for the timely intervention of Governor Ayo Fayose. This action represents a new low in the Federal Government’s resolve to harass and persecute real and perceived enemies of the Buhari administration under the guise of an anti-corruption crusade. It is reprehensible for the government to attack members of the families of its perceived enemies, especially wives and children, for any reason whatsoever. In addition to freezing Chief Fani-Kayode’s accounts, the Federal Government has ordered the freezing of accounts of his wife, Precious Chikwendu, several of which were opened and operated long before their marriage. These accounts have been frozen for no reason other than her marriage to Chief Fani-Kayode.